Those features on their own would be huge (I'm especially happy to have parameter support and a report wizard), but the developers have gone a step further. In addition to all of these new major features (and obvious bug/performance improvements), they are also shipping two report converters in Q2! 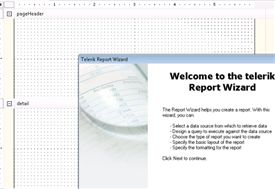 With Telerik Reporting 1.5, you'll be able to automatically convert existing Active Reports and Crystal Reports to Telerik Reports directly from the "New Report" wizard in Visual Studio. And even though you'll need the latest version of those two report formats to use the converters when this ships, it is definitely a good sign of things to come. If you looked at Reporting at Q1 and were turned-off by some of the missing features, definitely take some time to look again in Q2. The Reporting team is doing a great job of establishing Telerik Reporting as a first class reporting product and I can't wait to see what they'll manage to deliver in version 2. For now, start counting down the days- Telerik Reporting 1.5 ships early next week with the rest of the RadControls.